1. With Firefox open, visit https://www.GoodGopher.com inside the Firefox browser. 2. Once GoodGopher.com has loaded, click the magnifying glass icon on the left side of the search box at the top of the browser. Then click the "Add Good Gopher" option. This will add Good Gopher to the list of available search engines. 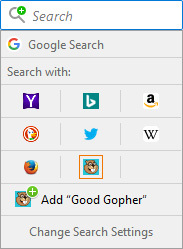 Once finished, Good Gopher will be a search engine option in Firefox and should be listed as a search shortcut icon. Continue to the next step if you wish to make Good Gopher Firefox's default search engine. 3. 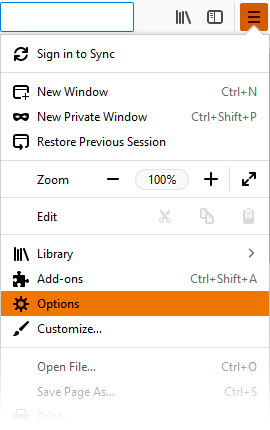 Click the "Menu" icon at the top right corner of the browser and choose "Options." 4. Next, under Options, click "Search" (on the left side of the screen). 5. 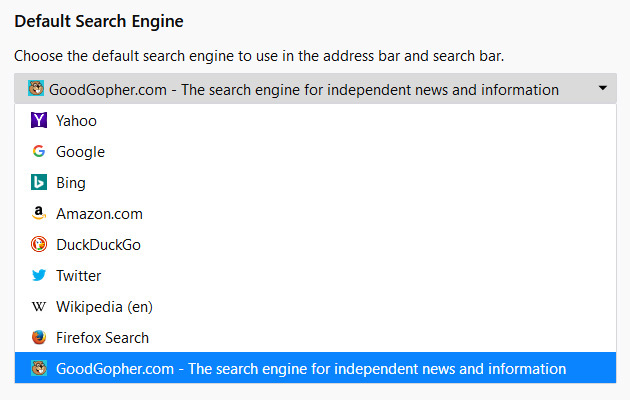 Scroll down to the "Default Search Engine" area and choose "GoodGopher.com" from the drop down menu. That's it! 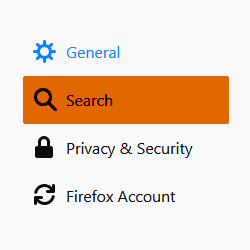 Good Gopher is now your default search engine when searching using Firefox's built-in search bars. For more information, please see Mozilla's official instructions.